My dad was quite possibly the least fashionable person I have ever known. Perhaps that explains to a large degree my own lack of fashion sense. Actually, it's not that I lack fashion sense; it's just that I don't particularly care what I look like. Given how my father dressed whenever he was forced to not wear his Air Force uniform, I guess I inherited that "whatever-at-least-I'm-dressed" attitude from him. After doing his 30 years and retiring at the ripe old age of 52, he and my stepmother and stepson moved to Florida, where he probably fit in, clothing-wise, better than he would have fit in elsewhere. Of course, at 52, he was competing with 80- and 90-year old folks who hadn't purchased new clothes in decades. There were times, I'm sure, he out-mismatched them. Black pseudo-dress shoes, white athletic socks, jam shorts, and Hawaiian aloha shirt, with a bonus white Hanes undershirt peeking through. Or how about the floral green and pink shirt, atop yet another white undershirt, over knee-length denim shorts, black socks and brown loafers? When he was diagnosed with the brain tumor just five short years into retirement, I purposely selected outlandish hats for him to wear. He wore them proudly, never once suspecting the sense of hilarity with which I had purchased them. It was after his retirement -- and before any sense that a cancer would grab him soon enough -- that I achieved a nonchalance about his attire. I'm sure it had to do with my leaving the teen years and heading into adulthood that caused that shift. Certainly, he had made no alterations to what he chose to wear. My stepmother nudged me to the point of acceptance, and even a bit of glee at his appearance, when someone asked her how she could stand to go out in public when he looked the way he did. "It's not like I dress him," she said. For the past couple of years, the only clothes Youngest has worn are shorts and a soccer jersey. We're happy if the shorts are over a pair of underwear, but that's not a requirement for us (unless he's going to soccer practice or a match). His outfit is complete with a pair of ankle-length athletic socks, which begin their residence in our house as white but soon become, first, off-white and, then, a dingy-used-to-be-white-and-now-more-brown. Really, the socks are the only thing detracting from his overall appearance to the outside world. Well, and the amount of dirt on his legs that he proudly earns while playing soccer at recess and lunch and after school. Oh, and the filthy fingernails which get their filth from the same place. Because his mother is such a lousy laundress, Youngest was in dire need of more socks. [His underwear will be outgrown before they are worn out.] At Target yesterday, deciding between a six-pack and a 10-pack of the athletic socks, I glanced down at him and saw him eyeing something else. He pulled the pack down and handed it to me. "Are you sure?" I asked incredulously. He was. 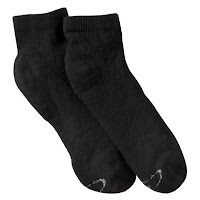 Which is how my nine-year-old boy, whose grandfather died fully 15 years before his birth, has come to be sporting black socks with his sneakers. At least they'll hide the filth. And, hell, it's not like I dress him. All these years I thought he was doing it on purpose to embarrass us. Great memories sis! Delightful post full of warm memories and a great perspective on the youngest. Fight the big issues, he is obviously happy marching to his own drummer. I was raised to dress well-matched and it took me years to overcome my aversion to more careless attire. Now I see that as very freeing, I wear what is comfortable and don't care who cares! Excellent post, when i was kid, i always thinking my father was embarass me in front of my friends with more vaguely as dark and thin, dressed always in neat dark hanes clothing especially the very thin soles of my father`s shoes.